Why did the turkey cross the road? Because chivalry ain’t dead, according to a bunch of Internet commentators who love nothing more than an anthropomorphic animal. Of all the human behaviours we attribute to Mother Nature’s finest, this male turkey standing guard as his younger companions cross the road has to be one of the cutest examples. An authoritative turkey was caught on camera by a passing driver, Donald Pomerleau, who had to stop in the road while the tom – another word for a male turkey – played lollypop person until the animal followed its fellow fowl off the roadway and to safety. 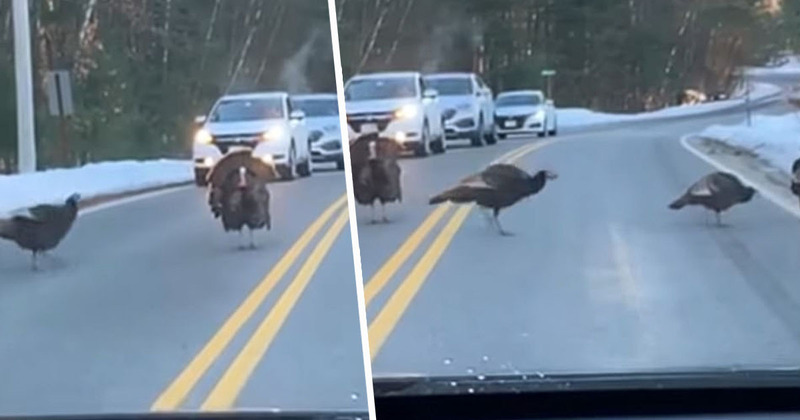 The gobbly gentlebird was filmed behaving like a stern crossing guard on a busy two-way road in Litchfield, New Hampshire, on Thursday (March 14). The puffed out bird follows a few of his feathered friends but stops near the double yellow lines to look down the road as others pass by. He proceeds to stand in the same spot and stare down the oncoming traffic until the last of the turkey troop – which numbers at least a dozen birds – passes him by to get safe and sound on the other side. It seems to work, as the cars stop dead in the middle of the road, before he calmly turns to follow his avian companions – likely to be a group of females or male young – off the asphalt and to relative safety on the other side of the road. The odd crossing might’ve been inconvenient for some of the human road users involved, but it’s a welcome sight for the state’s fish and game department. They say wild turkeys had all but disappeared from New Hampshire just 150 years ago due to habitat loss and the lack of hunting regulations. After four decades of conservation efforts, during which turkeys were replanted back into the wilds, their numbers are at an estimated 25,000. With this kind of teamwork, this particular group of turkeys – collectively named a rafter, as I today learned – have a good idea about how to survive in numbers. To be fair, if I were a human road user being stared down by the avian kingdom’s answer to an angry-looking Emperor Palpatine/Darth Sidious, I’d think twice about trying to edge around his flock. Birds of a feather, hey?